Wicked tickets NYC dates join the list of Broadway tickets that get discounted by TicketHunterOnline.com. 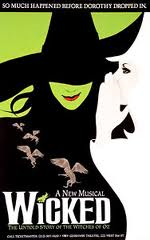 Shoppers can get the deal at tickethunteronline.com by entering promo code "wicked" at check out. "Wicked tickets NYC" for the "Gershwin Theater" get the highest promotional discount from Ticket Hunter Online. The premiere internet ticket reseller is pushing the blockbuster musical as part of an ongoing Broadway ticket discount. The promotion includes Wicked the Musical, Book of Mormon and Matilda. Musical fans can get a 20% discount by going to tickethunteronline.com and entering "wicked" at check out. Visa card holders get an additional discount at physical locations. "Wicked tickets NYC" have been in high demand. The musical topped total event sales as listed by Ticketnews for the last week of June. A prequel to The Wizard of Oz, the Wicked plot begins before Dorothy leaves Kansas. A green skinned girl from Munchkinland, Elphaba Thropp deals with discrimination and helps take care of her disabled sister, Nessarose. When she goes to college, her Shiz University roommate is a pretty blonde called Galinda Upland. Although it is hate at first site, the girls eventually form an uneasy friendship. Spokespeople at Ticket Hunter Online say they are focusing on the top 3 hit Broadway musicals in hopes to spur continued traffic to the site. "We're offering the promotion on all Broadway tickets but we currently have the largest inventory of Wicked tickets, Motown tickets and Matilda tickets. The bottom line is that we would like to see more sales in the Musical category since we are normally a concert heavy ticket company," stated Michael Quinones CEO of Ticket Hunter Online. Tickets for "Wicked" the Musical at the GershwinTheater can be purchased for as low as $15 on Tickethunteronline.com.